“Empty Bowls,” an annual fund-raising event for the Salvation Army in north Mississippi, will be held this year on Wednesday, Mar. 14th. Tickets for the “luncheon to feed the hungry” are $15 each. Each ticket holder gets a bowl of soup and a surprise gift. The surprise is in a paper bag. Each bag contains a pottery bowl created by a local potter, amateur or professional, so each is a surprise when the bag is opened. Doors at Building V of the Tupelo Furniture Mart in Tupelo will open at 10:30 am. Soup will be served from 11 am to 1 pm. 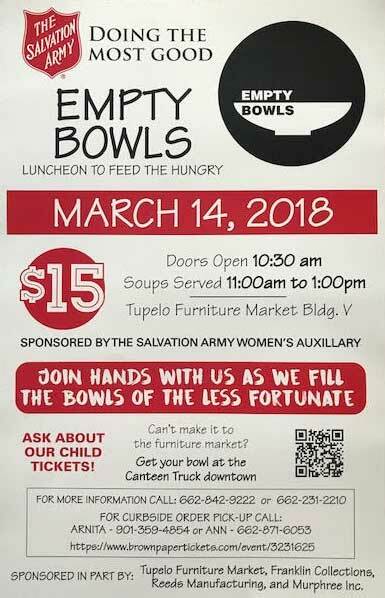 Empty Bowls is sponsored by the Salvation Army Women’s Auxiliary with help from the Tupelo Furniture Market, Franklin Collections, Reeds Manufacturing, and Murphree, Inc. It didn't just happen, but is the result of decades of work by exceptional individuals.